Aptly titled, Lift Your Spirit is a collection of feel-good neo-soul hits with a pop-friendly vibe. Aloe Blacc is an artist with recognizable work, but not necessarily the most recognizable name. Anybody who has caught a glimpse of American television over the last five months has surely seen an advertisement for Beats by Dre featuring Kevin Garnett or Colin Kaepernick transforming a world of jeering fans and hecklers into a comforting chorus of "Go ahead and tell everybody / I'm the man, I'm the man, I'm the man." The song is a hit, but it didn't necessarily make Aloe Blacc a household name. The same can be said for his 2010 hit "I Need a Dollar". The song was everywhere, but Aloe Blacc's name just isn't as big as you might expect it to be considering he’s had so many successes. Maybe it’s just that the market for pop-soul isn’t that big. 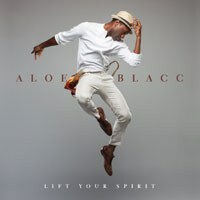 Regardless, Aloe Blacc is back with his third LP, Lift Your Spirit. The album encompasses a variety of styles with production from DJ Khalil, Pharrell Williams, Theron Feemster, and the Rock Mafia. Aloe Blacc is sticking to what he generally does best, and that’s feel-good soul music with a retro feel but a modern touch. There are plenty of catchy hits on Lift Your Spirit. If you don’t instantly recognize "The Man" and "Ticking Bomb", it won’t be long before they’re stuck with you. There’s also the raw, acoustic version of "Wake Me Up". His uncredited vocals on the Avicii track are yet another instance of his voice being everywhere but his name slipping under the radar. The acoustic version of the hit is much less in-your-face than the remixed Avicii version, but it’s an interesting alternative and helps to add another strong track to the album. The tracklisting of Lift Your Spirit can differ greatly depending on what region your copy of the album comes from. The order of songs feels like it might as well have been chosen at random, which hurts the overall experience of listening to Lift Your Spirit in one sitting. The album definitely feels like it targets the pop audience more than Blacc’s previous, more soulful works, and the cohesiveness takes a hit as a result. While it is more pop friendly, it’s not always a bad thing. Aloe Blacc’s voice is still as soulful as ever, but the new direction makes the music more accessible to a wider audience. Lift Your Spirit is an album that's going to have a lot of appeal with an audience that's looking for catchy songs that would fit right in on any Top-40 radio station. Aloe Blacc blends neo-soul and pop, and he certainly succeeds at making it approachable to fans of any genre. However, those fans who are anticipating a more traditional soul album may be let down to know that Lift Your Spirit leans more heavily on the contemporary side of things. The album doesn't have a lot of replay value, and the songwriting is hit-or-miss, but Aloe Blacc is able to tap into a market that isn't seeing a lot of action right now. If you like what you've heard of Aloe Blacc, even if you didn't know it was him, Lift Your Spirit would be a good starting point to dive deeper into his music.